The Traxens Company was created in 2012; it is developing a real time worldwide container tracking and tracing system. This young innovative business was founded in 2012 by Michel Fallah, Alain Hojeij, Pascal Daragon and Mickael Nasreddine. 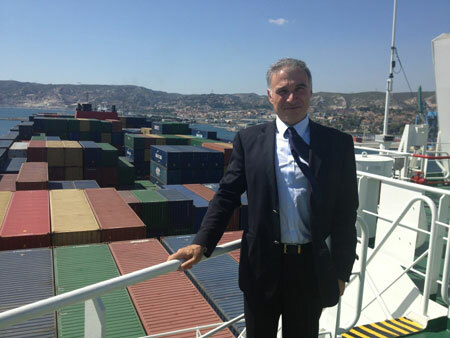 Supported by the Impulse incubator and based in the Marseille Innovation business nursery, the company develops and operates a "Worldwide Container Information Platform" that informs the actors of the containerised freight chain in near real time about all events, whether scheduled or exceptional, which occur during the life cycle of cargoes. The solution lies at the heart of the Physical Internet (ð). The Physical Internet develops supply chain optimisation, helps speed up flows, fosters modal transfer from road to more environmentally friendly modes, lowers energy bills and the costs of information systems (IS), improves safety and security, keeps abreast of evolutions in Customs and promotes cooperation between the actors of the freight ecosystem throughout the world. Beyond the R&D programme initiated with major research laboratories (INRIA, Télécom SudParis and LEAT), dedicated to the development of the key technologies required for the solution, a cooperative programme named 4TRAX, aims to both the consolidation of the solution and the creation of high added value applications. Labelled by the SCS and Mer competitive clusters, it is jointly funded by the French Interministry Fund (Call for Project 15) and backed by the Customs Administration, PACA Logistics Cluster and CRITT Transport and Logistics. Within this framework, Traxens is associated with strategic partners in the freight ecosystem (GREENMODAL Transport, MGI), research laboratories (Ecole des Mines, I3S), as well as SMEs specialising in the design of special microprocessors, energy recovering systems and M2M connectivity.